New shocks and refined forks from SR Suntour. If you have been patiently waiting or the SR Suntour Tri Air shock featured in last year’s coverage, your wait is nearly over. 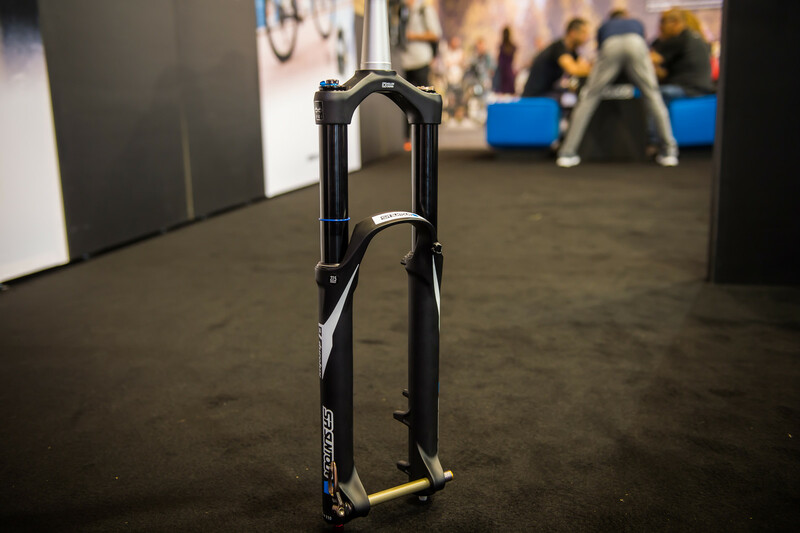 Although SR Suntour athletes have been riding the shock for a year, it hasn’t been available to the general public until now, just after this Eurobike. The Tri Air will finally go on sale for a little more than 400 Euros. The Tri Air shock is available in both metric and metric trunnion sizes. It features and air volume spacer system and SR Suntour’s Piston Compensator System. Three modes of compression available at the flick of a switch and eight clicks of rebound that can, of course, both be externally adjusted. 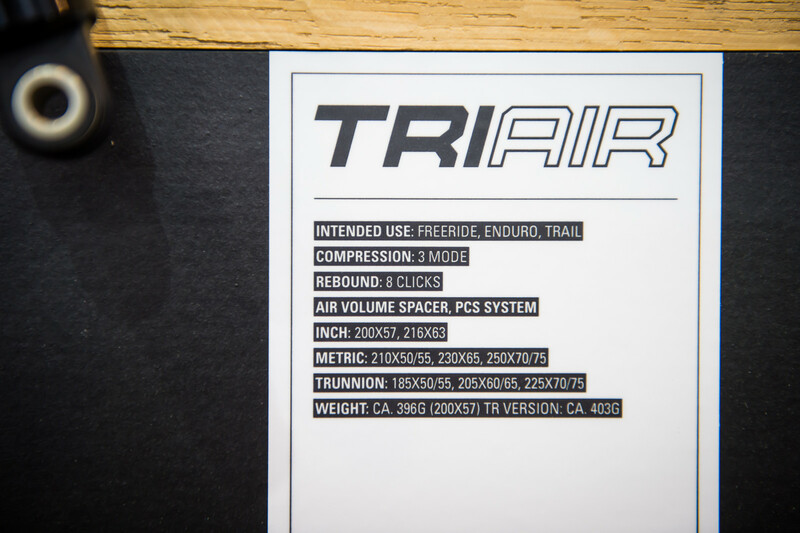 This freeride, enduro, or trail shock can be further customized by changing out the number of volume spacers in the main air can. 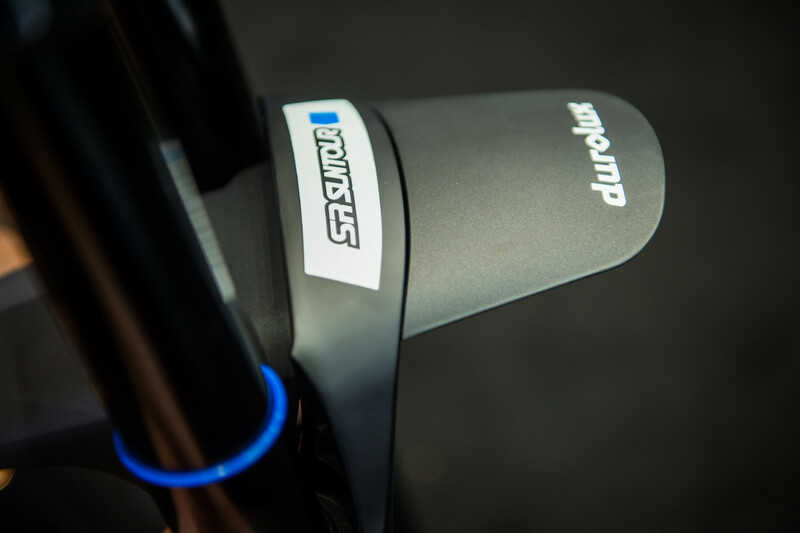 On the fork side of the aisle, SR Suntour’s big-hitting Durolux fork is now available in 27.5-inch versions as well as a 29-inch, both Boosted. For this year the casting has been entirely redone saving about 100g in the process. It comes with a very slick, optional fender that integrates very nicely with the fork arch, just like on big brother, the Rux downhill fork. The damping cartridge offers adjustable high- and low-speed compression as well as rebound. And on the spring side, the air volume can be adjusted. The fork now weighs in at about 2.1 kg (4.6 pounds) and will retail between 740 and 750 Euros making it a particularly competitive offering in this space. And to wrap things up, SR Suntour now has a smaller shock option for those looking to equip their cross country or trail bikes – the Edge. 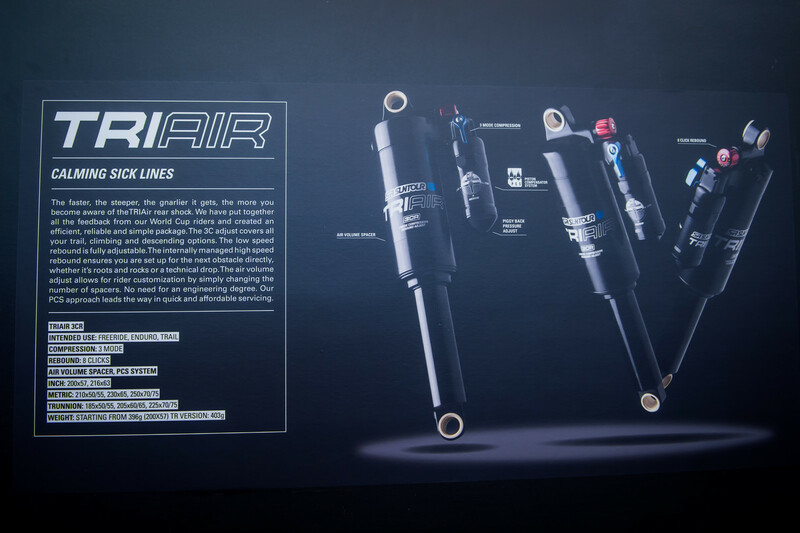 Once again available in both standard and trunnion metric sizes, this lightweight air shock hovers around 260 grams with several versions available. The one on display here features a remote lockout and adjustable rebound, but other versions are available as well. One obvious difference which set the Durolux back was its weight compared to the likes of the Fox 36 and the Lyrik. 2100g without the steerer cut means it is, by and large, the same weight as the aforementioned other brands. suntour makes DVO products. bryson has worked with them for years, so they probably share some traits. Suntour... please invest more in the graphical design of your products. They look like they're made in Microsoft Office. This is a shame because the technology sounds quite promising, they just look super cheesy and bland.